 Sink your teeth into this chocolate peanut butter cheesecake (photo courtesy Plugra). 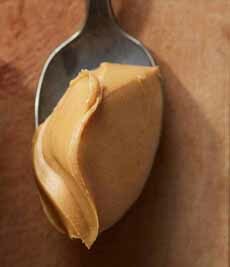 Use your favorite creamy peanut butter (photo courtesy Jif). 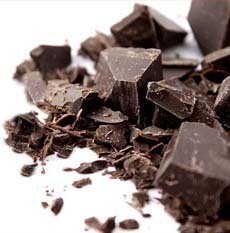 The better the chocolate you use, the better-tasting the outcome will be (photo courtesy Nothin’ But Foods). National Peanut Butter Day is January 24th. We’ve had many flavors of cheesecake in our time, but never one with peanut butter. There’s a first time for everything. And this cheesecake is not just peanut butter: It’s “peanut butter cup,” with a layer of chocolate. The recipe is from Jack McDavid, Chef/Owner of Jack’s Firehouse in Philadelphia (located in a 19th-century firehouse). Prep time is 45 minutes, bake time is 1 hour plus cooling and refrigeration for 12 hours or overnight. 1. MAKE the crust. Place the crust ingredients in food processor until smooth. Press into a 9″ springform pan and refrigerate until ready to use. Preheat the oven to 350°F. 2. MAKE the filling: Place chocolate and butter in double boiler over simmering water, stirring occasionally until smooth. 3. PLACE the cream cheese, sugar and eggs in a bowl and beat until creamy. Separate the cheese mixture into 2 equal parts. Add the peanut butter to one half and blend well. Add the chocolate to the other half and blend well. 4. POUR the chocolate mixture into springform pan. Pour the peanut butter mixture on top. 5. BAKE for 1 hour. To tell if your cheesecake is done, gently shake the cheesecake. If it looks nearly set and only a small circle in the center jiggles slightly, it is done. The center will firm up as it cools. Do not use a knife to check doneness. 6. TURN OFF the oven off and allow to cool for 1 our in the oven, with the door cracked open. Then remove it from the oven and let the cake cool completely on the counter, to room temperature. 7. COVER and chill the cheesecake in the fridge for 12 to 24 hours, but serve it at room temperature. Remove it from the fridge about 1 hour before serving. If you like, slice the cheesecake while it’s still cold, to make slicing easier. Use a knife dipped in hot water.